Russian Foreign Minister Sergey Lavrov is meeting with his Azerbaijani and Armenian counterparts Elmar Mammadyarov and Zohrab Mnatsakanyan respectively in Moscow today to discuss prospects for the Nagorno-Karabakh settlement. The closed-door consultations will take place following the March 29 Vienna meeting between Azerbaijani President Ilham Aliyev and Armenian Prime Minister Nikol Pashinyan accompanied by mutual war rhetoric. 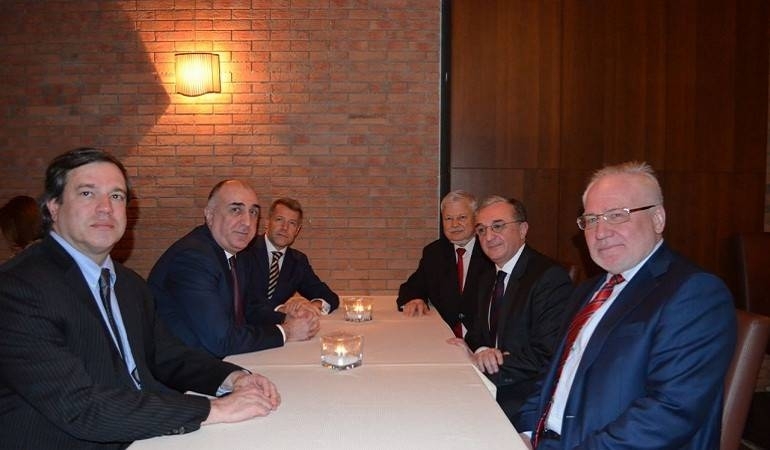 The meeting between Aliyev and Pashinyan in Vienna was their fourth personal meeting but the first official negotiations. The two leaders earlier met on the fringes of the CIS summits in Dushanbe and St. Petersburg (in September and December 2018) and at the World Economic Forum in Davos (on January 22). The most important result of the Vienna round was the parties’ willingness to continue direct dialogue on a peaceful settlement. The Minsk Group co-chairs noted at that time that the leaders highlighted the importance of creating an environment conducive to peace and taking further specific and tangible steps in the negotiation process to find a peaceful solution to the crisis. Aliyev and Pashinyan also agreed on humanitarian measures to resolve the Nagorno-Karabakh conflict and reaffirmed the need for a ceasefire and improvement of the direct communication mechanism. In the meantime, the military rhetoric of the defense ministries of Armenia and Azerbaijan does not diminish. Armenian Defense Minister David Tonoyan said on the day of negotiations between the Azerbaijani and Armenian leaders in Vienna, in the presence of the Armenian community in New York, that he had replaced the formula "land for peace" with the formula "new war for new areas". In his opinion, Armenia will increase the number of military units that can bring the war to the enemy's territory. The statement was also supported by Armenian Prime Minister Nikol Pashinyan. Azerbaijani Defense Minister Zakir Hasanov in response said that "if Armenia goes on the offensive, I will have the opportunity to meet Tonoyan in Yerevan". However, on April 7, the Armenian defense minister that "we do not want a war, but Azerbaijan's military-political leadership should prepare its army for peace". Responding to this statement, the spokesman for Azerbaijani Defense Ministry Vaqif Dargahli said there was no country in the world whose army prepares for peace. The task of the army is to be constantly in a state of vigilance to protect the independence, sovereignty and territorial integrity of their countries. He referred to President Ilham Aliyev, saying that sustainable peace would only be possible if the occupied territories would be returned to Azerbaijan. The leadership of Armenia should recognize once and for all that our army can only think about peace after the occupied territories have been liberated. Under the current conditions, the Azerbaijani army is not ready for peace but for war, Dargahli added. The following day, the Armenian defense boss told that Armenia was preparing its assault troops for a war against Azerbaijan. "In case of a provocation, we meet face to face on the enemy's territory. If necessary, our storm troopers can cause havoc behind the frontline," Tonoyan added. The press secretary of Azerbaijan's Ministry of Defense described Tonoyan's recent statements as "illogical and nonsensical". The statement by Tonoyan is a direct threat against civilians. The press spokesman suggested that the Armenian defense minister's recent statements might be directed against Nikol Pashinyan and that Tonoyan wanted to sharpen his own profile for a future political career. Meanwhile, the wife of the Armenian Prime Minister, Anna Hakobyan, spoke about the need for peace. In an interview with Voice of America, she talked about her initiative "Women for Peace". She emphasized that thousands of soldiers died in vain in Nagorno-Karabakh. "There were thousands of victims, but this was for nothing because these victims did not bring us closer to resolving the conflict. Perhaps, they have even taken us further away from a solution because we cannot find a solution to the conflict under the existing conditions," Hakobyan said. The official negotiations on the Nagorno-Karabakh conflict were resumed with a meeting between Azerbaijani President Ilham Aliyev and Armenian Prime Minister Nikol Pashinyan on March 29, 2019 after a long break caused by the transfer of power in Armenia. Armenian Prime Minister Nikol Pashinyan’s position rules out the talks for the discussion as he pursues his own agenda, that is, security and strengthening the cease-fire and so on. These are all topics that lead to the freezing of the situation. Armenia categorically refuses to discuss issues related to the liberation of the occupied territories, continues to insist on changing the format. In this situation, I do not see any prospects for this meeting. The only fact that can be mentioned is an imitation of some kind of negotiations, in fact, pushing aside confrontation and the resumption of hostilities, Azerbaijan’s former Foreign Minister Tofiq Zulfuqarov said in commenting on the April 15 meeting in Moscow between Foreign Ministers of Azerbaijan and Armenia - Elmar Mammadyarov and Zohrab Mnatsakanyan. Humanitarian issues are most likely an exchange of prisoners. It is possible that in this context something will be announced in Moscow. Everything is clear. We want Armenia to liberate the occupied territories. Armenians do not intend to liberate Nagorno-Karabakh, but also the territories around it. After this position voiced by them, any negotiations lose their meaning. Therefore, we are now faced with an attempt to reanimate some imitation process. Tofiq Zulfuqarov did not exclude the fact that, in order to better imitate the start of negotiations, it is possible that some of the prisoners of war will be released. However, the essence of the conflict in the current situation is that the main task and substantive theme is the liberation of the territories of Azerbaijan from the Armenian occupation. All other topics related, although they have a certain value, but do not solve the causes of the conflict. The international community should clearly state, as in other cases, or adopt sanctions against Armenia, the diplomat believes. “In our case, mediation does not solve the conflict, since we are left alone with the aggressor, who must be persuaded to leave the occupied territories. How is this possible to implement? It is impossible to implement. Therefore, each new meeting is an indicator that a process is underway, something is happening somewhere. In fact, nothing serious, decisive and significant in this matter can happen - as long as the international community does not put pressure on the aggressor country. Or until Azerbaijan, in accordance with its right, does not repel the aggressor, and does not expel it from the occupied territories,” Zulfuqarov summed up. Talks on the Nagorno-Karabakh settlement have been going on since 1992. Russia, the U.S. and France are co-chairs of the Minsk Group of the Organization for Security and Cooperation in Europe (OSCE) that acts as a mediator in resolving the crisis. Nagorno-Karabakh is internationally recognized part of Azerbaijan, but it is occupied by Armenia, which sees itself as a protector of the Karabakh Armenians.